Despite considerable interest in the use of Moringa oleifera as a nutrient source, gaps and inconsistencies in the information on the nutrient content of this interesting plant remain. There are many reasons for this. The nutrient content of newly harvested plant material naturally varies with soil and climate as well as season and plant age. Differences in processing and storage procedures add more variation; and the use of different analytical techniques amplifies the variation further. For moringa leaves, additional variation has been created over time due to errors created as nutrient content values are incorrectly copied from source to source (30). The purpose of this review is to summarize the more recent scientific information about the nutrient content of fresh Moringa oleifera leaves and dried Moringa oleifera leaf powder. Literature Search: A search of the literature on the nutrient content of Moringa oleifera leaves was performed using PubMed as well as internet searches, with an emphasis on locating original sources of information reported in the last 20 years. Papers in professional publications where the methods were described, and analyses from university and commercial labs specializing in nutrient analysis were included. One unpublished analysis of a sample of moringa leaf powder by a professional laboratory in 2011 was also included. Types of leaves and processing procedures included: This summary provides data on the nutrient content of mature leaves. For dried leaves, values for sun, shade, and oven dried were utilized; but values for leaves which had been blanched, sulfited, or freeze dried were omitted as these procedures are less commonly available. Several authors provided data for different cultivars or harvests. Some of these authors provided data for each sample, and others averaged the samples together. When the data for individual samples were provided, the individual samples were averaged and used as one value. Table construction: The nutrient data was compiled into tables providing the nutrient content of 100 grams of fresh leaves or dried leaf powder. A number of papers provided data based on the dry matter content of the leaves only. For these papers, the nutrient values were converted to 100 grams of leaf or leaf powder using the moisture values provided in the paper. If the data were provided on a dry matter basis only and the percent moisture for that sample was not provided, conversion to a the amount in fresh leaves or leaf powder was done using the average moisture content of fresh or dried leaves. For nutrients where more than two independent data sources were identified, the average and standard deviation of the nutrient values provided was calculated. If only two values were available, both were included as a range. If only one value was available, it is provided. For fresh leaves the values were compared to those published in three current reference sources: The United States Department of Agriculture National Nutrient Database3, Nutritive Value of Indian Foods from the National Institute of Nutrition18, India, and the World Health Organization West African Food Composition Table46. Contribution to Nutrient Needs: The table values were used to estimate the percent of the nutrient needs of a 1–3 year-old child that would be provided by a typical serving—1 tablespoon of dried leaf powder or 1 cup of raw fresh leaves. When no original source data were available for a particular nutrient, the FAO West African Food Composition Table values were used. There is considerable variability in the nutrient values reported, especially for minerals and fat-soluble vitamins (Table 1). For the B vitamins, no recently published values were identified. Nutrient values are provided on a 100-gram basis, but for practical purposes it is important to note that this is substantially more than one person would consume as a single serving. As is the case for fresh leaves, the reported nutrient content of dried leaves varies considerably (Table 2). Dried leaves are not included in the United States Department of Agriculture National Nutrient Database3,The Indian Council of Medical Research Nutritive Value of Indian Foods18, or the Food and Agriculture Organization West African Food Composition Table46. Nutrient values are provided on a 100 gram basis, but for practical purposes 5 grams (15 mL or 1 tablespoon) is a reasonable serving size. Table 3 provides a comparison of the nutrient content of one tablespoon (5 grams) of dried moringa leaf powder and 1 cup (20 grams) of fresh leaves to the nutrient needs of 1–3 year old children. Both dried and fresh leaves appear to contain a substantial amount of the magnesium, iron, folate, and vitamins B-6, A, C, and E young children need. They are also a moderately good source of calcium, niacin, protein and dietary fiber. A 1 cup serving of fresh, raw leaves appears to be a better source of a number of vitamins, especially vitamin C. However, vitamin levels will likely drop if the leaves are cooked. It is important to note that for many of these nutrients the data is limited or highly variable. Table 4 provides a comparison of the nutrient content of one tablespoon (5 grams) of dried moringa leaf powder and 1 cup (20 grams) of fresh leaves to the nutrient needs of pregnant and lactating women. Both fresh and dried leaves provide substantial sources of vitamins A and E, and fresh leaves provide a substantial amount of vitamin C. Moringa leaves also appear to provide moderate amounts of calcium, magnesium, iron, thiamin (dried leaves) and vitamin B-6. In adults, two servings per day might be used to increase nutrient intake. In addition to the overall amount of protein in a food, it is important to consider the essential amino acid content of the food protein as well as its digestibility. Moringa leaf protein amino acid content compares favorably to the World Health Organization scoring pattern (Table 5). There are no reports of moringa leaf digestibility using the current gold standard, rat digestibility. However, there are two studies using incubation with digestive enzymes which have yielded results ranging from 56%33 to 89%10. Protein digestibility of 56% is low, but 90% is high compared to the digestibility of other plant proteins. Table 1: Nutrient content of 100 grams fresh, raw Moringa oleifera leaves. ACrude fiber measures significantly underestimate dietary fiber for humans. BWhen values for fresh leaves were not available and drying would not be expected to impact nutrient content significantly, an estimated value calculated using the value for dried leaves adjusted for the differences in moisture content is provided. CEstimated from µg b carotene using 12 µg beta carotene = 1 µg RAE. This likely underestimates actual vitamin A activity slightly as other carotenes contribute to vitamin A activity, though to a lesser extent than beta-carotene. Table 2: Nutrient content (mean +/- std dev) of dried Moringa oleifera leaves. ACrude fiber measures significantly underestimate dietary fiber for humans. The total dietary fiber value provided is based on the fiber content of the dried leaves. BEstimated from µg beta-carotene using 12 µg beta-carotene = 1 µg RAE, this likely underestimates actual vitamin A activity slightly as other carotenes contribute to vitamin A activity, though to a lesser extent than beta-carotene. Table 3: Contribution of fresh and dried Moringa oleifera leaves to the nutrient needs of 1–3 year–old children. AValues are from the references 11 – 15. BFor these nutrients the amount of data is limited or the data is highly variable. CThe value provided in parentheses is for vegetarian diets. DEnergy needs estimated for a 25-year-old woman who is 5’4” (1.63 m) tall, weighs 126 lbs (57 kg) and is active for 60 minutes or more per day. Moringa oleifera has been given a lot of attention as a nutrient source, and has been studied more than many other plants. The published data on the nutrient content of this interesting plant is quite variable, both in terms of quantity of information and differences between published sources. Much of the variability is likely due to differences in soil, climate, and plant age; and processing techniques such as drying clearly impact vitamin content. If Moringa oleifera is utilized as a part of a supplemental feeding program, samples should be analyzed periodically throughout the program to ensure that planned nutrient targets are being reached. In addition, more information about the nutrient content and digestibility of this plant would be helpful, especially: (1) an analysis of B-vitamins and dietary fiber using current methodologies, (2) an analysis of how soil type, soil mineral content and plant age impact the mineral content of the leaves, (3) an analysis of how sun, shade, and oven drying impact vitamin content, (4) an analysis of how digestible the protein and other nutrients in the leaves are. 1. _____. Covance Laboratories. 2011. Certificate of analysis for Moringa oleifera leaf powder provided by Educational Concerns for Hunger Organization (ECHO), unpublished. 2. _____ 2007. Protein and amino acid requirements in human nutrition: Report of a joint FAO/WHO/UNU expert consultation. Technical Report Series No. 935. WHO Geneva. 3. _____ 2013 U.S. Department of Agriculture, Agricultural Research Service. USDA national nutrient database for standard reference, release 25. https://ndb.nal.usda.gov/ndb/search/list Updated 2016. 4. Amaglo, NK., R.N. Bennett, R.B. LoCurto, et al. 2010. Profiling selected phytochemicals and nutrients in different tissues of the multipurpose tree Moringa oleifera L., grown in Ghana. Food Chemistry 122:1047–1054. 5. Aslam, M., F. Anwar, R. Nadeem, et al. 2005. Mineral composition of Moringa oleifera leaves and pods from different regions of Punjab, Pakistan. Asian Journal of Plant Sciences 4(4):417–421. 6. Banerji, R., A. Bajpai and S.C. Verma. 2009. Oil and fatty acid diversity in genetically variable clones of Moringa oleifera from India. Journal of Oleo Science 58(1):9–16. 7. Barminas, J.T., M. Charles and D. Emmanuel. 1998. Mineral composition of non-conventional leafy vegetables. Plant Foods for Human Nutrition. 53(1):29–36. 8. Begum, S., M.F. Ahmed and M. Rahman. 2009. Effect of cooking temperature and storage period on preservation of water soluble vitamin C content in Citrus macroptera and Moringa oleifera lunk. Asian Journal of Food and Agro-Industry 2(3):255–261. 9. Coote, C., M. Stewart and C. Bonongwe. 1997. Malawi Government Forestry Research Record Number 67. Zomba, Malawi: Malawi Government Forestry Research Service. 10. Elkhalifa, A.E.O., S.A.A. Ahmed and S. Adam. 2007. 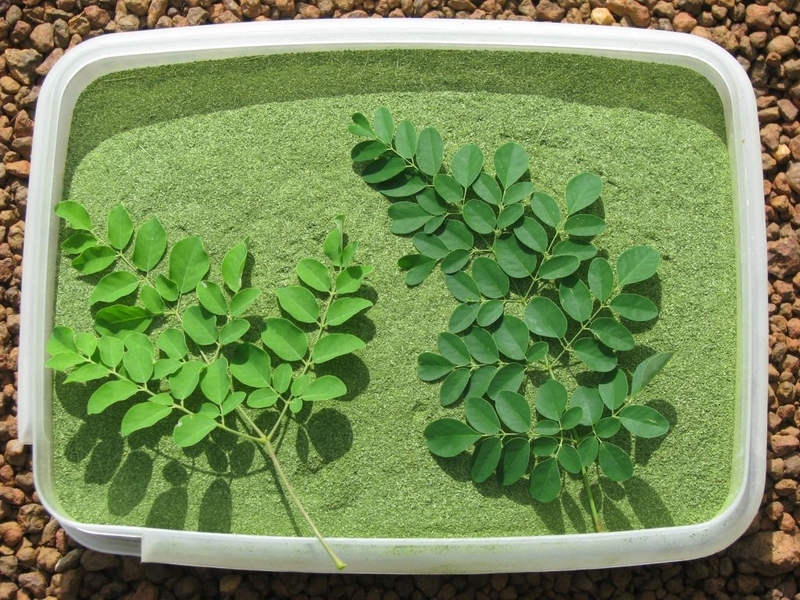 Nutritional evaluation of Moringa oleifera leaves and extract. Ahfad Journal. 11. Food and Nutrition Board, Institute of Medicine. 2005. Dietary Reference Intakes for Energy, Carbohydrate, Fiber, Fat, Fatty Acids, Cholesterol, Protein, and Amino Acids. Washington DC: National Academies Press. 12. Food and Nutrition Board, Institute of Medicine. 1998. Dietary Reference Intakes for Thiamin, Riboflavin, Niacin, Vitamin B6, Folate, Vitamin B12, Pantothenic Acid, Biotin, and Choline. Washington DC, National Academies Press. 13. Food and Nutrition Board, Institute of Medicine. 2000. Dietary Reference Intakes for Vitamin C, Vitamin E, Selenium, and Carotenoids. Washington DC: National Academies Press. 14. Food and Nutrition Board, Institute of Medicine. 2001. Dietary Reference Intakes for Vitamin A, Vitamin K, Arsenic, Boron, Chromium, Copper, Iodine, Iron, Manganese, Molybdenum, Nickel, Silicon, Vanadium, and Zinc. Washington DC: National Academies Press. 15. Food and Nutrition Board, Institute of Medicine. 2010. Dietary Reference Intakes for Calcium and Vitamin D. Washington DC: National Academies Press. 16. Freiberger, C.E., D.J. Vanderjagt, A. Pastuszyn, et al. 1998. Nutrient content of the edible leaves of seven wild plants from Niger. Plant Foods for Human Nutrition 53:57–69. 17. Fuglie, L.J. 2001. The miracle tree. Moringa oleifera: Natural nutrition for the tropics training manual. New York: Church World Service. 18. Goplan, C., B.V.R. Sastri, S.C. Balasubramanian, et al. 1999. Nutritive value of Indian foods. Hyperabad, India: National Institute of Nutrition. 19. Gowrishankar, R., M. Kumar, V. Menon, et al. 2010. Trace element studies on Tinospora cordifolia (menispermaceae), Ocimum sanctum (lamiaceae), Moringa oleifera (moringaceae), and Phyllanthus niruri (euphorbiaceae) using PIXE. Biological Trace Element Research 133(3):357–363. 20. Gupta, K., G.K. Barat, D.S. Wagle, et al. 1989. Nutrient contents and antinutritional factors in conventional and non-conventional leafy vegetables. Food Chemistry 31:105–116. 21. Juliani, H.R., Y. Fonseca, D. Acquaya, et al. 2010. Nutritional assessment of moringa (Moringa spp) from Ghana, Senegal and Zambia, Chapter 25. In: African Natural Plant Products: New discoveries and challenges in chemistry and quality. Washington, DC: American Chemical Society 469–484. 22. Kakengi, A.M.V., J.T. Kaijage, S.V. Sarwatt, et al. 2007. Effect of Moringa oleifera leaf meal as a substitute for sunflower seed meal on performance of laying hens in Tanzania. Livestock Research for Rural Development 19(8). 23. Kidmose, U., R.Y. Yang, S.H. Thilsted, et al. 2006. Content of carotenoids in commonly consumed Asian vegetables and stability and extractability during frying. Journal of Food Composition and Analysis 19:562–571. 24. Kowsalya, S., U. Chandrasekhar and R. Balasasirekha. 2001. Beta carotene retention in selected green leafy vegetables subjected to dehydration. The Indian Journal of Nutrition and Dietetics. 38:374. 25. Lockett, C.T., C.C. Calvert and L.E. Grivetti. 2000. Energy and micronutrient composition of dietary and medicinal wild plants consumed during drought. Study of rural Fulani, northeastern Nigeria. International Journal of Food Science and Nutrition. 51(3):195–208. 26. Maiga, A., D. Diallo, R. Bye and B.S. Paulsen. 2005. Determination of some toxic and essential metal ions in medicinal and edible plants from Mali. Journal of Agricultural and Food Chemistry 53:2316–2321. 27. Makkar, H. and K. Becker. 1997. Nutrients and antiquality factors in different morphological parts of the Moringa oleifera tree. The Journal of Agricultural Science 128:311–322. 28. Makkar, H.P.S. and K. Becker. 1996. Nutritive value and antinutritional components of whole and ethanol extracted Moringa oleifera leaves. Animal Feed Science and Technology 63(1):21–228. 29. Manh, L.H., N.N.X. Dung and T.P. Ngoi. 2005. Introduction and evaluation of Moringa oleifera for biomass production and as feed for goats in the Mekong Delta. Livestock Research for Rural Development 17(9). 30. McBurney, R.P.H., C. Griffin, A.A. Paul and D.C. Greenberg. 2004. The nutritional composition of African wild food plants: From compilation to utilization. Journal of Food Composition and Analysis 17:277–289. 31. Mohammed, K.A.F., L. Sarmiento-Franco, R. Santos-Ricalde and J.F. Solorio-Sanchez. 2012. The nutritional effect of Moringa oleifera fresh leaves as feed supplement on Rhode Island Red hen egg production and quality. Tropical Animal Health and Production 44:1035–1040. 32. Nambiar, V.S. and S. Seshadri. 2001. Bioavailability trials of beta-carotene from fresh and dehydrated drumstick leaves (Moringa oleifera) in a rat model. Plant Foods for Human Nutrition 56(1):83–95. 33. Ndong, M., S. Wade, N. Dossou, et al. 2007. Nutritional value of Moringa oleifera, study of the bioavailability of iron and the effect of enrichment of various traditional Senegalese meals with powder of the leaves. African Journal of Food Agriculture, Nutrition, and Development 7(3). 34. Olugbemi, T.S., S.K. Mutayoba and F.P. Lekule. 2010. Effect of moringa (Moringa oleifera) inclusion in cassava based diets fed to broiler chickens. International Journal of Poultry Science 9(4):363–367. 35. Radek, M. and G.P. Savage. 2008. Oxalates in some Indian green leafy vegetables. International Journal of Food Sciences and Nutrition 59(3):246–260. 36. Rajyalakshmi, K., K. Venkatalaxmi, Y. Venkatalakshmamma, et al. 2001. Total carotenoid and beta-carotene contents of forest green leafy vegetables consumed by tribals of south India. Plant Foods for Human Nutrition 56:225–238. 37. Sanchez-Machado, D., J. Nunez-Gastelum, C. Reyes-Moreno, et al. 2010. Nutritional quality of edible parts of Moringa oleifera. Food Analytical Methods 3:175–180. 38. Sanchez-Machado, D.I., J. Lopez-Cervantes and N.J.R. Vazquez. 2006. High-performance liquid chromatography method to measure alpha- and gamma-tocopherol in leaves, flowers and fresh beans from Moringa oleifera. Journal of Chromatography 1105: 111–114. 40. Sena, L.P., D.J. Vanderjagt, C. Rivera, et al. 1998. Analysis of nutritional components of eight famine foods of the Republic of Niger. Plant Foods for Human Nutrition 52:17–30. 41. Seshadri, S. and V.S. Nambiar. 2003. Kanjero (Digera arvensis) and drumstick leaves (Moringa oleifera): Nutrient profile and potential for human consumption. In Plants in Human Health and Nutrition Policy. Artemis P, Simopoulis PA, Goplan C (eds.) World Review of Nutrition and Dietetics. Basil, Karger 91:41–59. 42. Shih, M.C., C.M. Chang, S.M. Kang and M.L. Tsai. 2011. Effect of different parts (leaf, stem and stalk) and seasons (summer and winter) on the chemical compositions and antioxidant activity of Moringa oleifera. International Journal of Molecular Sciences 12(9):6077–6088. 44. Soliva, C.R., M. Kreuzer, N. Foidl, et al. 2005. Feeding value of whole and extracted Moringa oleifera leaves for ruminants and their effects on ruminal fermentation in vitro. Animal Feed Science and Technology 18:47–62. 45. Sreeramulu, N., G.D. Ndossi, K. Mtotomwema. 1983. Effect of cooking on the nutritive value of common food plants of Tanzania: Part 1- Vitamin C in some of the wild green leafy vegetables. Food Chemistry 10:205–210. 46. Stadlmayr, B., U.R. Charondiere, V.N. Enujiugha, et al. 2012. West African food composition table. Rome: The Food and Agriculture Organization of the United Nations. 47. Subadra, S., J. Monica and D. Dhabbai. 1997. Retention and storage stability of beta-carotene in dehydrated drumstick leaves (Moringa oleifera). International Journal of Food Sciences and Nutrition 48:373. 48. Yameogo, C.W., M.D. Bengaly, A. Savadogo, et al. 2011. Determination of chemical composition and nutritional values of Moringa oleifera leaves. Pakistan Journal of Nutrition 10(3):264–268. 49. Yang, R.U., T. Samson, T. Lee, L. Chang, G. Kuo and P. Lai. 2006. Moringa, a novel plant rich in antioxidants, bioavailable iron, and nutrients. In: Ho CT, ed. Challenges in chemistry and biology of herbs. American Chemical Society 224–239. I would like to thank Catherine Joseph and Amy Krug, Nutrition Students at Messiah College, for their assistance in preparing this report.